The Federal Operations Unit Zone ‘A’ of the Nigeria Customs Service (NCS) on Thursday made public, seizures of different illegal imports with a duty paid value (DPV) of N2.2 billion. 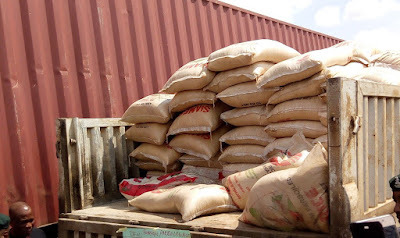 Briefing newsmen on the seizures made, the Area Controller, Mr. Mohammed Aliyu, said that the seizures which were made between September 4 and October 3, include 22 exotic vehicles, 11,303 bags of foreign parboiled rice (equivalent of 18 trailers) and 2,410 frozen poultry products. Aliyu said also seized were 853 jerrycans of vegetable oil, 245 parcels of Indian hemp, 4x40ft containers of unprocessed wood, 2,017 bales of used clothing, 283 cartons of various pharmaceuticals which were all without NAFDAC Registration number. A breakdown of the seized goods showed that the various contraband had a total DPV of N2.01bn. Among the 22 vehicles under detention/seizure were Nine Bullet proof vehicles including 4 Lexus Jeep LX570 (2016), 3 Land Cruiser Jeeps (2016) and 2 Mercedes Benz G63 and S550 (2014/2015), 1 Toyota Rav4 (2015), 3 Toyota Hilux (2018) and 2 Toyota Highlander (2018). Other vehicles were 1 Toyota Prado (2018) 1 Toyota Land cruiser (2016), 1 Toyota Corolla, 1 Toyota Fortuner (2017), 1 Toyota Sequoia, 1 Lexus RX 350.. The Controller told newsmen that the seized Indian hemp and the medicaments would be handed over to NDLEA and NAFDAC for thorough investigation. Sending warnings to suspected smugglers, whom he described as economic saboteurs, the Controller said the Unit would always advance tactical strategies to make smuggling a regrettable venture for perpetrators. He commended the officers for their operations, and mentioned also that the Unit had arrested 28 suspects in connection with the 89 seizures.